The recent increase in civil engagement in many African countries, especially the rise of oppostional politics, is in large measure, a response to the declining political capacity of the African state. Excitedly triggered by the realization slowly taking place on the continent that democratization will not come from periodic elections, which political parties have for so long mistakenly viewed as their exclusive domain of operation. Thankfully, of late in Africa, various sectors of civil society are becoming nurseries for alternatives political leadership and clean politics. At the centre of which one finds efforts to address persistent questions of marginalisation, discrimination and exclusion- with demands such as “individual must be given capacity to exercise their vote free from external constraints or threats of non-provision or withdrawal of resources from non compliance with political party demands” becoming a common feature. Sadly, equally taking place on the continent is a deceptive electoral phenomena. From Freetown to Cape Town, Kigali to Kumasi, there seems to be a revitalised resurgence of both popular and elite concern with issues revolving around democracy with referenda and electioneering visibly discernable. It is a prominence that has not been seen since the heady early days of independence in the 1960s or the crusade for multipartism in the early 1990s. While elections are often a poor guide to a country’s overall state of democracy and civil liberties, and a mere number of them can be deceptive, of late it has gained currency by becoming a regular episode sometimes even in the unlikeliest of places on a continent once dubbed “Hopeless” because of the regularity of its coups and civil wars. In recent years, the culture of elections seems to have infected even the most known of dictatorial leaders-Presidents al-Bashir, Mugabe and Prime Minister Meles Zenawi of Ethiopia alongside others. In August, Rwanda’s incumbent Paul Kagame was returned to power with a landslide 93 percent; while on the same month Kenya’s referendum on a new constitution was approved by 67 percent of votes with 30 percent objecting; In July, voters on the semi-autonomous Tanzanian island of Zanzibar voted 66.4 percent in favour of a referendum designed to end years of political strife that had marred previous elections while 33.4 percent voted against the power-sharing proposal supported by the ruling Chama Cha Mapinduzi party (CCM) and leaders of the main opposition Civic United Front party (CUF) in time for the October elections. June saw Burundians also going to the polls. Yoweri Museveni of Uganda, who has ruled the country for 26 years, plans to ask the Ugandan electorate, yet again, for another term next year. In Egypt, the question of replacing Hosni Mubarak come next year’s elections, has taken on increased urgency amid concerns about the aging president's health following surgery in Germany earlier this year. The ruling National Democratic Party seems to be grooming Gamal Mubarak (Hosni’s son), a 46-year-old investment banker turned politician to succeed his 82-year-old father, who has ruled Egypt for nearly 30 years. Meanwhile in Nigeria, President Goodluck Jonathan is preparing himself for the country’s elections expected in January, where it has emerged that former Nigerian vice-president Atiku Abubakar and former military leader Ibrahim Babangida are to participate. The presidential nomination by the ruling People's Democratic Party (PDP) is likely to be contentious owing to an unwritten rule that power should rotate between Nigeria's Christian south and Muslim north every two terms. President Jonathan’s predecessor, Yar'Adua who died during his first term, was a northerner, so the next term should be held in reserve for a northern Nigerian. In Guinea, following two decades of dictatorial rule by Lansana Conté, the army seized power after his death two years ago and has promised a return to civilian rule after elections that they’ve promised soon and in which they have vowed not to contest. The troubled semi-autonomous region of Somaliland has followed Ethiopia in subjecting its citizens to the ongoing electric circuit of elections in Africa. By the end of the year, 48 African countries would have held a referendum of some sort or gone to the polls for a concoction of local, regional or national elections, leading The Economist recently to conclude that “it is a big year for the African voter. The electoral calendar has never been so crowded”. And indeed, albeit with slight trepidation, one could be tempted to go a step further than the international weekly magazine and describe, fallaciously, the present developments as constituting a new epoch in African history- an “electoral wind of change” blowing across the continent. A hasty look at several recent polls shows that too often African referenda and elections are just a travesty. In Burundi the incumbent, Pierre Nkurunziza, with the opposition boycott, won unopposed 92% of the vote, while in neighboring Rwanda, Paul Kagame secured an amazing 93 percent, in spite of accusations by international observers of also shutting out opposition. In Ethiopia those opposed to Meles Zenawi’s ruling party won just a mere two out of a possible 547 seats. While in Sudan, Africa’s largest country, the size of a quarter of the United States, Mr Bashir won against an opposition that had also largely boycotted the event. Sudan is expected to hold a referendum in January 2011 in the southern part of the country, which will decide whether the vast oil and mineral-rich state, whose political and economic fortunes have largely been determined by the Arab ruling elite in the north – remains united or splits into two distinct countries: the predominantly Moslem and Arab north and the Christian, black south. The irony of it all though, is – while the rest of the country’s population of 35 million holds its breath – this momentous decision will only be arrived at by 51% of the current population living in the Southern part, where there are still problems identifying those legible to cast the decisive ballot. Also boundaries near lucrative oil fields meant to be demarcated before the referendum are yet to be delineated, and President Bashir's party has recently indicated that it is in no mood to allow the referendum to take place until the internal border dispute is resolved. In Egypt, the question of replacing Hosni Mubarak come next year’s elections, has taken on increased urgency amid concerns about the aging president's health following surgery in Germany earlier this year. The ruling National Democratic Party seems to be grooming Gamal Mubarak (Hosni’s son), a 46-year-old investment banker turned politician to succeed his 82-year-old father, who has ruled Egypt for nearly 30 years. Too often Africa’s big men still find a way to stay put, regardless of voters’ preference. For instance, just before Sudanese went to the polls in April, President Omar al-Bashir invested a great deal of time and money in ensuring that there could be only one outcome. Constituencies were comprehensively gerrymandered. Fake parties were created with names that sounded very similar to the real opposition, in order to confuse the largely illiterate voters. In Kenya, President Mwai Kibaki who clang to power after the elections of 2007 and Zimbabwe’s hard-man Robert Mugabe who also refused to go after a clear verdict against him in 2008, triggered widespread violence in both countries; both eventually accepted power-sharing agreements with the opposition as a face saving formula. The riggers’ sophistication or lack of is testament not just to their determination to hold on to power, but also to African voters’ growing insistence on having a say in their governance and democratic process. 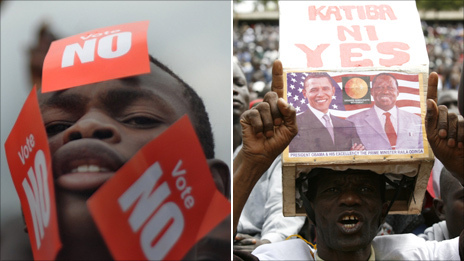 The post election violence witnessed by Zimbabwe, threats of violence in South Africa, Ethiopia in 2005, and the furious “Kibaki asibaki” orchestras in Kenya in 2007, are constant reminders of the need for ‘free and fair elections’ whose results are incontestable, and are respected by all citizens and institutions of democracy. In modern democratic systems of representative governance, that most African countries are struggling to emulate, elections are periodic contests which determine the next set of rulers in a nation state. In many ways, while the notion of a free and fair election is subject to numerous interpretations, in Africa the majority of elections are yet to be free let alone fair. Most countries in Africa have become formally democratic by legislating multiparty politics, holding elections establishing constitutional courts and adopting new constitutions just to satisfy the requirement for ‘policy-based lending’. The changes that have taken place have largely been cosmetic and outside the purview of donors, it is business as usual. The regime of deprivation and abuse of civil and political rights effectively continue curtailing the participation of majority of Africans in the governance process. With only 15 percent of countries on the continent having adult literacy levels above 50 percent and abject poverty a norm for the majority of Africans, a fundamental rethinking of the meaning and role of referenda, elections and democracy in Africa ought to be necessary. For a start, the control of Electoral Commissions should reside with the legislature or judiciary rather than with the executive. South Africa participatory and transparent process of appointing commissioners, which has worked well so far, ought to be emulated right across the continent. To reduce desperation and high stakes engendered by the ‘winner-takes-all’ politics, the first-past-the-post electoral system used in many African countries, should, if possible, be replaced by the Proportional Representation system, which guarantees more opportunities for power sharing and bargaining among competing parties. Otherwise, the postcolonial state will remain a fundamentally illiberal institution. The challenge for civil society in Africa must therefore be to cultivate a democratic environment by changing the predatory nature of the state first and then engage elections. Ronald Elly Wanda is a Political scientist lecturing at Marcus Garvey Pan-Afrikan University, Mbale, Uganda.